Grass Trees cannot be posted like the rest of our plants. For orders over $200 we offer free delivery every few months along the main route (and up to 5km off) between Bundaberg and Brisbane. A charge of $20 applies if you are 5-10km off the highway, and $50 for 10-30km off, sorry we cannot deliver elsewhere. Please contact us before ordering if you are unsure. If you are local you may pick up your plant from our retail outlet in Baffle Ck, Qld. For interstate orders we deliver to the courier company Toll Express (ph 07 32462800) for $20. Xanthorrhoea latifolia (a species of Australian Grass Tree) occurs in eastern Australia from about Innisfail in north Queensland to around Wyong in New South Wales. The salvaging of wild plants is currently strictly controlled by the EPA. Our plants are supplied with EPA registration tags. Grass trees are very important to native fauna - over 315 invertebrates and nearly 100 vertebrates have been recorded using Xanthorrhoea. There has been significant past indigenous and non-indigenous use of xanthorrhoeas. Traditional aborigines utilized Xanthorrhoea species. The plants were used to make spear handles, spears, fire sticks, tinder for fires, water proofing resin and binding resin for tools such as axes. Individual grasstrees were lit as signal fires. The leaves were used to cut meat. 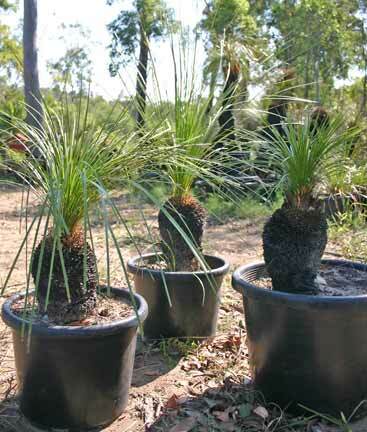 Xanthorrhoea were also an Aboriginal food source. Food included nutritious starch, shoots, tubers of young plants and young leaves, roots, grubs and nectar from the flowers. Nectar was extracted by dipping the inflorescences in water to produce a sweet drink. In Queensland X. latifolia subsp. Latifolia is recorded from 10�1300m altitude, growing in coastal dunes, rocky headlands, coastal plains (including wetter soils), slopes and rocky ridges. Habitats in which it has been recorded in Queensland include eucalypt forest and woodland, wallum, heath, herblands and grasslands. It usually grows in sandy or gravelly soils in New South Wales, and sandy or stony soils in open eucalypt forest communities in south-east Queensland. The musk-scented flowers appear from March to October in NSW and from April to September in SE Qld. Xanthorrhoea latifolia is a long lived perennial plant with a trunk to 2m in height, occasionally taller, with a large flower stem. Leaves are green and about 4mm wide. In cross section the leaves are rhombic/triangular to nearly flat. The 3-lobed fruit capsules are embedded in the flower spike, each fruit containing three black seeds. To establish your new tree in your garden you need only to water every few days for a week, then once a week for a few months. For extra care water with a half strength to full strength seaweed solution once a week for a month after purchasing your tree. Drought hardy, prefers part shade. Needs free draining soil. Do not use fertiliser. Will be happy indoors if occasionally brought outside. Outdoors if in full sun will need regular watering. Water once a week if in a pot, and if in the ground once established only needs a good soak monthly during the dry. If planting in the ground (in sandy soil or on a mound) be careful not to disturb the roots and water in well. Also fine left in its pot - will never need re-potting in your lifetime! In rural/agricultural areas grass trees may be susceptible to a pest known as wireworm. Wireworms are the larvae of several species of Australian native beetles. The main symptom is weak, brown foliage that pulls out easily in the centre of the crown. The plants we receive have already been sprayed with an insecticide �lorsban�, other insecticides are also available. Unfortunately there is no organically certified alternative. If you are desperate, try burning off the foliage to kill the worms.